Stalls of writers who have turned publishers are also there in Krithi. The unique presence of 22 small-time publishers is what makes the Krithi International Book Fair stand apart from other book fairs of global standards. Along with the stalls of more than 110 big and medium publishing houses, the unique presence of 22 small-time publishers is what makes the Krithi International Book Fair stand apart from other book fairs of global standards. “Normally, these kind of large-scale book fairs are beyond our reach, but Krithi is an exception,” says K. Venugopal, owner of GK Readers Media, who has a stand in the book fair. The ‘GK’ in GK Books stands for Govindankutty, the yesteryear Malayalam cine-star who had played many a villain character throughout the 60s and 70s. Apart from doing villain roles, he had penned scripts for many Vadakkanpattu movies and also authored many novels and short stories. About 45 books of Govindankutty had been published during his lifetime (1924-1994). Fifteen books written by Govindankutty, including his autobiography, are available in GK Readers stand. Stalls of writers who have turned publishers are also there in Krithi. P. I. Shankaranarayanan, a famous poet in Malayalam known for his short poems, manages the stand of Navamana Books which sells his books. “We had our great writer Basheer carrying and selling his books all by himself in those days. 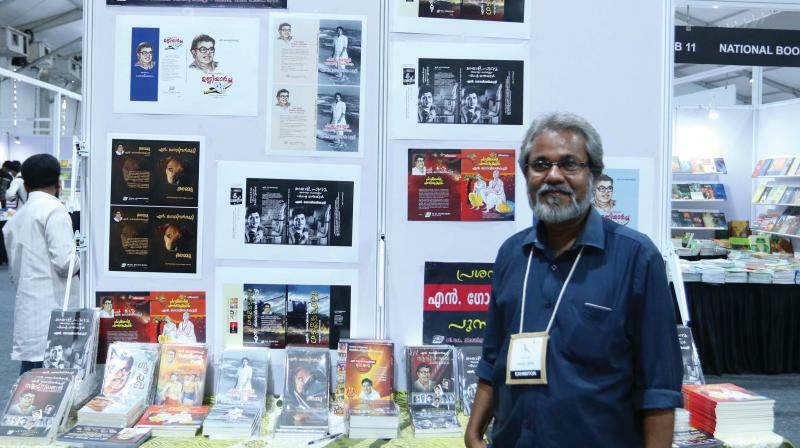 Now, here, Krithi has come up to help writers like me with the concept of exhibition stands where our readers meet us and buy books from us directly,” says Shankaranarayanan.